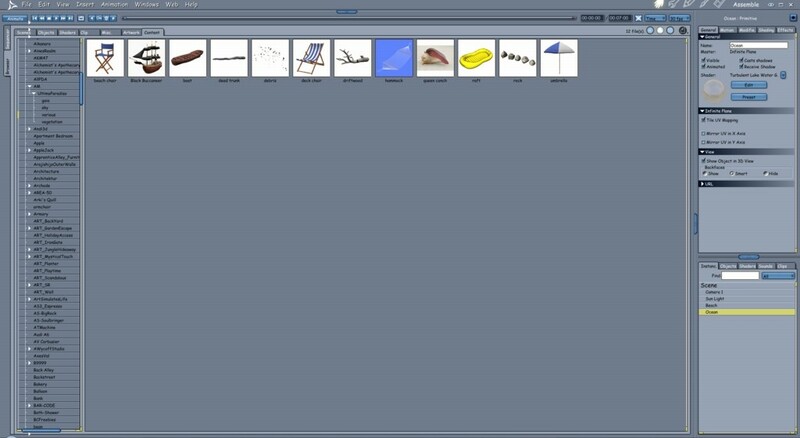 and now I can continue with Virtual Creation. 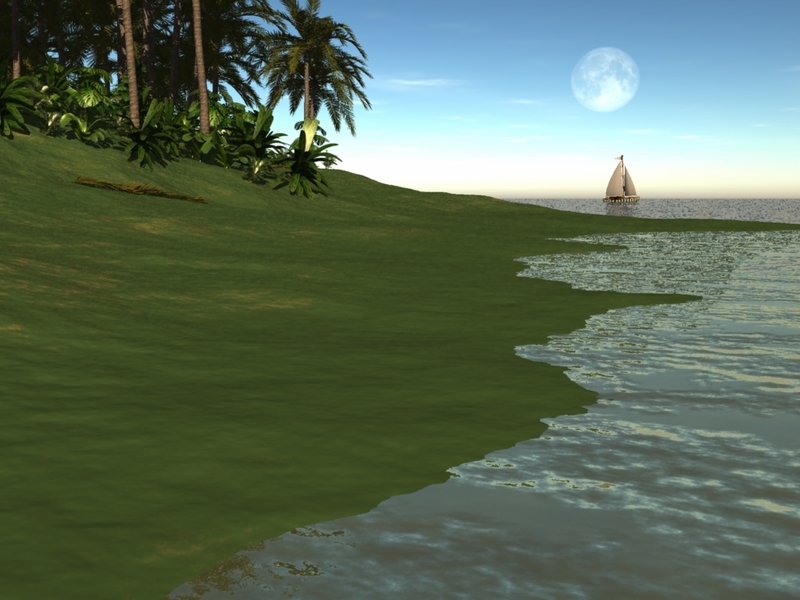 Last time we placed the basic parameters of the scene — the beach terrain, the ocean plane, and a basic sky. Today I’ll add some terrain details, along with the basic elements for our scene. Image 1. I’ve found some nice beach-type items that I may be able to use. The first thing I do is simply browse through what I already have. I have a huge library of elements to add to a scene, so I want to see what I already have available. More likely than not I won’t find exactly what I want, but there might be enough there to attempt a start. This is always an interesting process; sometimes I’ll start an image just by seeing what catches my fancy from the library. Image 2. 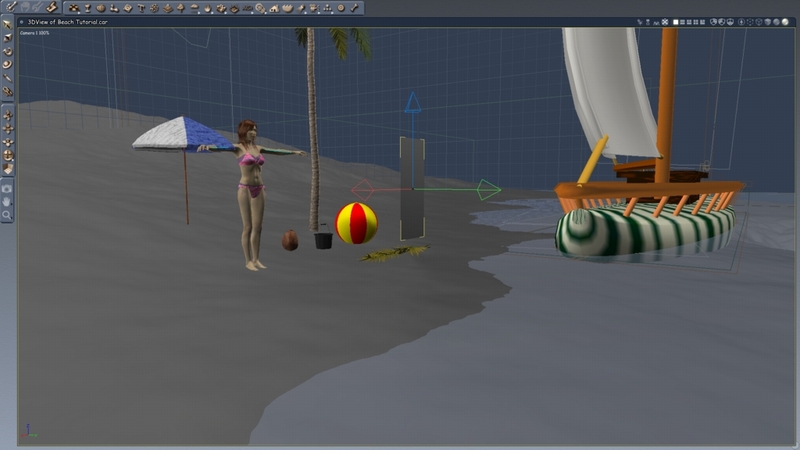 A set of stuff to start building a beach scene with. Image 3. Oh no! The dreaded “An error occurred…” screen! When I try to convert the plane, a window pops up. “An error occurred.” This is bad. Very bad. Suddenly it occurs to me that I don’t remember the last time I saved. Cursing, I click “ok”. Nothing happens. This is worse. Click click click — “Ok” “Ok” Ok” — no reaction at all. I curse more, diving deeper into my repertoire of swear words. Eventually I sigh, defeated. 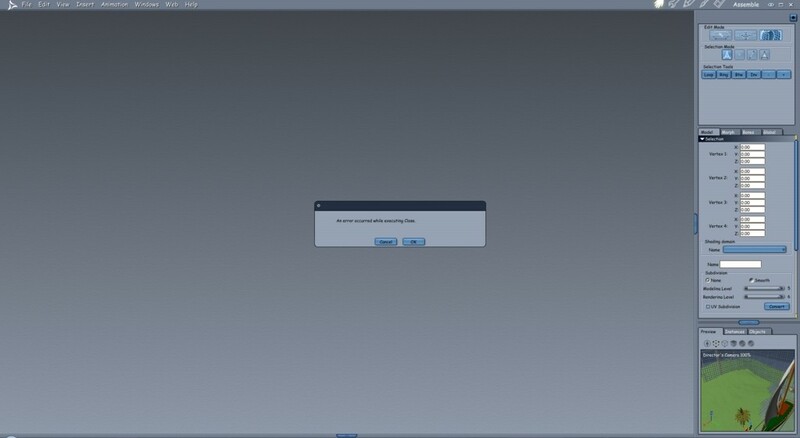 Carrara is an awesome program, but occasionally it will hit a bug the size of a deer. When that happens, there’s nothing to do but shut everything down and start over. I hold my breath as the scene loads again. It comes out as a sigh as I see that everything I’ve done for the past hour is gone. Well, at least I have the screenshots of where I’d been headed. Going into the library again, I start adding stuff to the scene. 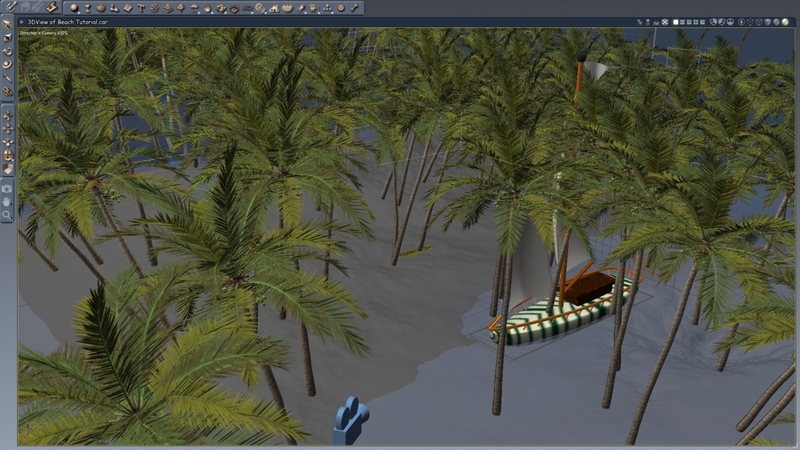 I stop, however, after I’ve gotten the sailboat, the coconut tree, and the leaf. Maybe I should do something with these before I go further. Image 4. The dialog box for a surface replicator. Here, I’m using it to make copies of the coconut tree I found earlier. I know I want a tree line at the top of the beach to suggesting the start of a forest. However, I don’t want to put in a bunch of trees by hand; although it might look nice, it’ll kill both my computer and my wrist. So I use what’s called a “surface replicator”. Basically, this useful little tool will make copies of an object (or group of objects) across the surface of something else. I grab a surface replicator and make copies of the coconut tree. Image 5. The trees have taken over! Someone call Durkon Thundershield! This is the result. 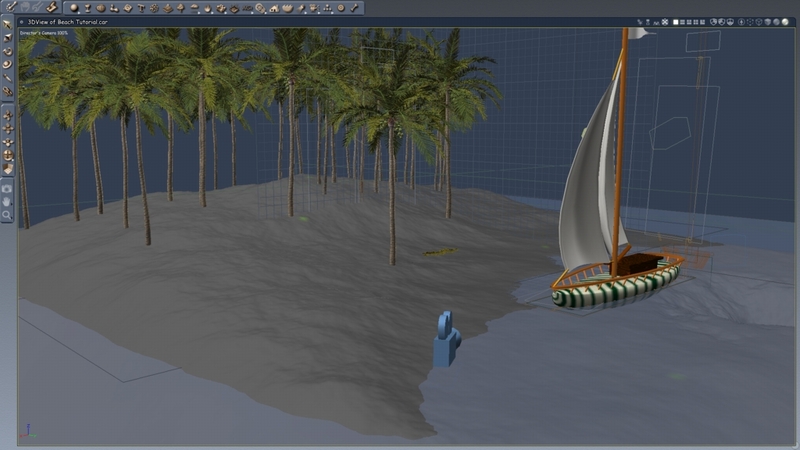 The replicator did exactly what I asked, which was to make copies of the coconut trees all over the beach terrain. Now I have to tell it where NOT to put the trees! I’ll do this using a shader. I think I mentioned earlier how awesome shaders are; here’s another example. The shader on the replicator is a grey-scale map that shows the probability of an object appearing at that location on the map. White represents a value near 100% — high likelihood of placement. So in the shader room I can map out where I want trees and where I don’t, as you can see in image 6 below. Image 6. We’ll corral the trees up away from the surf and sand. Image 7. The shader map has saved the day! When I head back to the assembly room you can see that now the trees are more orderly now, standing back away from the ocean, where they belong. I go back and forth between the shader room and the assembly room, tweaking the map until I have a nice tree density; I then add another surface replicator with some small ground plants to help fill out the forest area. Finally, I take that sailboat and shove it into the distance. I’ll need to work on its appearance — that striped hull has to go — but I like how the scene is coming together. Because there are more elements, the render below took about 15 seconds; it’s longer than last time, but not prohibitively so. Image 8. The image so far. We still need to make the beach area look like a beach, but at least we have a tree line! Not counting the time lost due to the crash, I’ve spent about two hours on the image today, for a total of three hours work. The scene is slowly coming together, although we’ve already had a few hiccups. Next time I’ll either resume the process of adding details to the scene, or I’ll begin shading the terrain so we have some sand. If you have an opinion, let me know in the comments section below! Very cool! Why does the sailboat look so different between Image 7 & 8? In image 7 I still had the sailboat up close, so before I did the “end of post render” I went ahead and slid the sailboat back into the distance, where I originally wanted it. Basically, because the model is a rough model I want it far away from the camera where the missing details aren’t as noticeable.